In-Vitro diagnostics (IVD) is a broad term which refers to the use of medical devices and accessories in order to perform wide ranging tests on bodily fluids such as blood, urine, tissue etc. Consequently, these tests provide meaningful insights about the health of a human body. IVDs may aid in either the detection of an infection, diagnosis of a medical condition, preventing a disease or monitoring the effectiveness of a drug therapy. IVD tests may vary from simple to sophisticated formats including reagents, calibrators, control materials, kits, software, and related instruments. Moreover, IVDs also differ in terms of their usage, for example: some tests are performed under a clinical/laboratory setting while others can be purchased over-the-counter (OTC) and performed at home with ease by the user. Under the IVD umbrella, there are wide range of segments which have been discussed in this report for instance, molecular diagnostics, clinical chemistry, immunochemistry/immunoassay, coagulation and hemostasis. The research study has segmented the entire IVD market into product and services type, technology, application and geographical region which enables the user gain a multi-dimensional view of the market. Geographically, the report identifies North America as the leading market in the industry owing to the advanced nature of the healthcare systems in United States and Canada, rising adoption rates of technologically advanced products and increase in the rate of acceptance of precision medicine. The research report employs an exhaustive and analytical approach to estimate and understand the market thus provides an all-inclusive insight into various forms of developments, market trends and strategies. 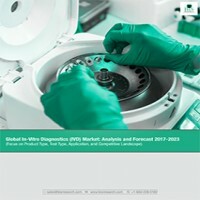 While underlining the key driving and restraining factors for the IVD market, the report also provides a comprehensive understanding in terms of competitive landscape, market share analysis, competitor benchmarking (matrices), and their positioning within the global in-vitro diagnostics market. • What are the major market drivers, challenges and opportunities of the global in-vitro diagnostics market and their use cases? • What are the drivers and restraints that influences the growth of the global in vitro diagnostics market? • What is the market share of the leading segments and sub-segments of the global in-vitro diagnostics market during the forecast period (2017-2022)? • How will each segment of the global in-vitro diagnostics market grow over the forecast period and the revenue share for each of them by the end of 2022? • Who are the leading players in the global in-vitro diagnostics market (2016 & 2017)? • Which geographical region will have the highest growth rate (CAGR) during the forecast period? • What are the key development strategies employed by the key players across various geographies? • What is the role of various regulatory and governmental agencies in global in-vitro diagnostics market across various geographical locations? • What are the major consumer preferences while purchasing or undergoing an IVD test? The report includes the company profiles for leading players in the IVD market which enables the readers understand the current competitive scenario that prevails in this industry. Some of the key player include Thermo Fisher, Roche, Abbott, Siemens Healthineers, Becton, Dickinson, Johnson & Johnson, Qiagen, and Danaher Corporation. Figure 14.36 SWOT: Qiagen Inc. The In-Vitro Diagnostic (IVD) sector is playing a central role in the shifting the healthcare and drug discovery landscape. Invigorated by the demand for changes in the healthcare environment and driven by a wave of molecular advances, the in-vitro diagnostic sector is actively engaged in innovation of new tools and technologies. Present day healthcare systems are already strained under the burden of a rising demand and soaring costs; and this trend is projected to exacerbate in coming years. The current challenges tend to be chronic age-related conditions such as cardiovascular diseases, cancer, and neurological diseases, and these will grow more prevalent as population demographics shift upwards. The increase in healthcare costs due to these conditions creates a need for improved tools for clinical decision-making—ones that are more specific, faster, more accurate, more informative, more affordable and less invasive than those in current practice. These tools hold promise to help shift the emphasis in medicine from reaction to prevention. IVD is expected to increase to $76 billion by 2023 and increase its influence over healthcare spending globally. The category’s rate of growth is accelerating due to a number of key macro forces, such as demand from emerging economies, aging population, evolving clinician attitudes, and a much needed push towards theranostics and personalized medicine. The molecular diagnostics (MDx) segment has continually outperformed the broader IVD category, and is a key driver of this market’s growth. IVD is uniquely positioned at the convergence of the life science and healthcare sectors. Diagnostics provide 60-70% of all the information doctors use worldwide, but make up just 2% of current global healthcare spending. Molecular diagnostics offer critical, personalized information to inform patient care. Diagnostics information is driving an increasing proportion of healthcare expenditure. The MDx market is projected to grow at the fastest CAGR projected at 7.3%. Commercial introduction of innovative technologies will be the key driver of growth in these segments. Tools enabling earlier, more accurate diagnosis, improved treatment decision and better treatment monitoring will encourage further adoption of innovation. Automation has been the driving growth across almost all segments. While the Infectious and Blood Screening markets are showing initial signs of development, significant growth is occurring in the Oncology and Genetic segments. Clinical validation of molecular tests and associated biomarkers are creating new emergent markets (e.g. HIV tests) and replacing some existing IVD assays. Genomics, proteomics, and metabolomics have generated a new source of biomarkers that are increasingly gaining clinical acceptance. Oncology is expected to comprise roughly 30% of the overall MDx spending in IVD by 2023. Immunoassays are testing procedures that employ specific antibody binding for measuring an analyte in a test sample. Since the mid-1960s, immunoassays continue to make a major contribution to clinical lab. In 2016, immunoassays of all types (automated, manual, ELISAs, enzyme immunoassays, bead arrays, and microarrays) dominate the IVD products offerings and represent about a third of the testing in the clinical laboratory. Immunoassays have become one of the primary and indispensable tools in the diagnosis and monitoring of all areas of medicine. By 2023, the market for immunoassay test market will grow by 5.9% annually. Complicated and limited availability of reimbursement options will restrain the growth of the market. The emergence of epigenomics-based diagnostics is expected to drive the IVD market in the future. The ability of molecular diagnostics to detect diseases at an early stage of development will also fuel the future growth of the market. North America’s huge market share is attributed to the well-structured healthcare system in the U.S. and Canada as well as to the large amount of public as well as private healthcare expenditure. The presence of a large patient pool and the increasing healthcare expenditure in the Asia-Pacific region are particularly fueling the growth in this market. Asia-Pacific is expected to outperform all geographies in terms of growth and is expected to grow at a CAGR of 5.7% from 2017 to 2023. In 2015, Roche Diagnostics, Siemens Healthcare, Abbott Laboratories, and Danaher had 47.5% of the market share. There are a number of future challenges for both the market leaders and niche suppliers. Large global IVD companies will continue expansion through acquisition, but will struggle to deliver organic growth, which also occurred in 2012. The competition will further intensify for niche suppliers as growing numbers of their customers, namely physician practitioners, are unable to maintain their profitability.